What is the DISC Function? 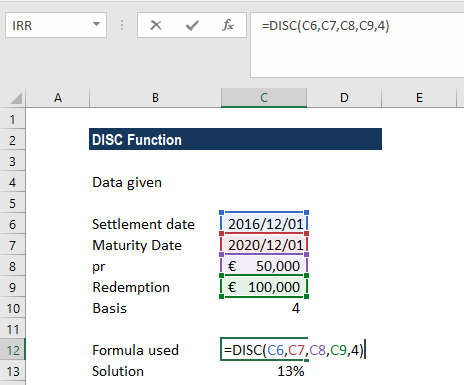 The DISC Function is a Financial functionFunctionsList of the most important Excel functions for financial analysts. This cheat sheet covers 100s of functions that are critical to know as an Excel analyst. It will calculate the rate of discount for a bondDiscount BondA discount bond is a bond that is issued at a lower price than its par value or a bond that is trading in the secondary market at a price that is below the par value. It is similar to a zero-coupon bond, only that the latter does not pay interest. A bond is considered to trade at a discount when its coupon rate is. It helps to know the discount rate when we know the other details about the bond. Settlement (required argument) – It is the date when the coupon was purchased. It is the security’s settlement date or the date after the issue date when the security is traded to the buyer. Maturity (required argument) – It is the maturity date of the security or the date on which the security expires. Redemption (required argument) – It is the security’s redemption value per $100 face value. 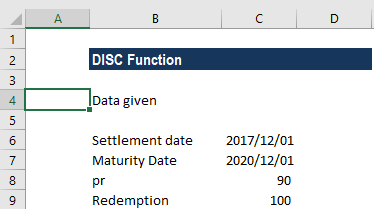 How to use the DISC Function in Excel? We get a result of 3%. If the result is in number format, we need to convert it into percentage format. We omitted the basis argument so the function took it as 0, which denotes the US (NADS) 30/360 day count basis). We gave the date arguments to the DISC function as references to cells containing dates. If the date format is not used, we will get an error as result. We used the basis 4 so the function took it as 4, which denotes the European 30/360 count basis. 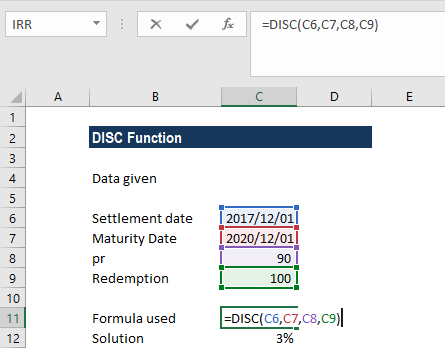 We gave the date arguments to the DISC function as references to cells containing dates. Remember, based on the settings of your system, text representations of dates into Excel functions may vary. Inputs for the arguments pr, redemption or basis are invalid numeric values. That is, if pr is less than or equal to 0, if redemption is less than or equal to 0, or basis given in the formula is not equal to 1,2,3 or 4. Dates are stored in sequential serial numbers, so they can be used in calculations. By default, January 1, 1900 is serial number 1, and July 16, 2016 is serial number 42567 because it is 42,567 days after January 1, 1900. 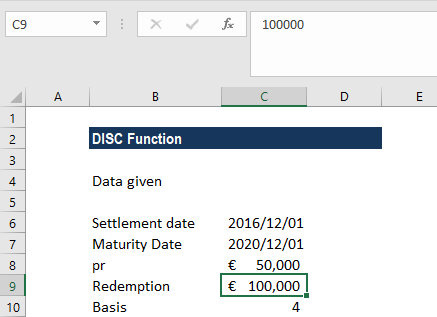 The given maturity date or settlement date is not a valid Excel date. Any of the given argument is a non-numeric value.